Spend the night in the latest, greatest and most fabulous new stays in the country. Brisbane’s Fortitude Valley just keeps getting cooler with the arrival of Ovolo The Valley. Inspired by the area’s colourful history, the 103 rooms are styled via Ovolo’s signature whimsical aesthetic, with statement art, custom wallpaper and eccentric furniture. The pièce de résistance is the rooftop pool looking out over the surrounding neighbourhood. Daydream, one of Australia’s best-loved Whitsunday island resorts is reopening after a serious makeover, with three restaurants and three bars added. A few past favourites are returning, albeit amped up a notch, such as the Living Reef – a free-form coral lagoon where guests can join the team of marine biologists to feed baby stingrays or visit the underwater observatory. Reflecting the Gold Coast’s recent funky revival, voco has an eclectic, fun-in-the-sun feel befitting its location. Rooms are rendered in a palette of neutrals and blue with pops of sunshine yellow, and come with views towards the ocean or the hinterland. Throughout there is a roster of restaurants and bars, a day spa, gym and pool. 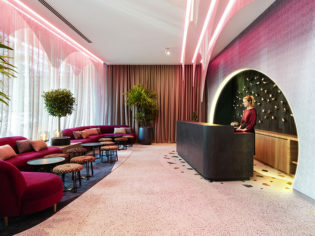 The Brisbane hotel scene just continues to grow: the first Westin in Queensland is open, with 299 guest rooms offering sweeping views from its prime position in the heart of the city, and a roster of health and wellness offerings, including a two-floor wellness centre, signature restaurants, two bars and resort-style facilities. Occupying a prime spot at the end of the iconic waterfront boardwalk in Cairns, Riley, a Crystalbrook Collection Resort has presented the Queensland city with a fresh take on hospitality. Its 311 rooms and suites, most with balconies, are stylish and contemporary, and there’s a lagoon swimming pool with private man-made beach, spa, fitness centre, restaurants and a rooftop bar. Spicers Retreats has added a second Hunter Valley property to its portfolio of luxury escapes: Spicers Guesthouse Retreat. An 18-month, $20-million refurbishment has resulted in the historic property it’s housed in now offering 49 rooms, including a four-room standalone cottage, state-of-the-art conference facilities, large-scale event spaces and a private dining room with a stacked-stone fireplace and a spectacular floor-to-ceiling wall of wine. From its plum position on the constantly buzzing Campbell Parade, Hotel Ravesis has been providing gracious boutique accommodation for years. But while the exterior of the 1914 building had a pretty pick-me-up back in 2016, along with the on-site bar and restaurant, the revamp of its 12 rooms and suites was only unveiled this year. The wait was definitely worth it though. Under the guidance of interior designer Carina Hicks, each has been given a sophisticated new focus, while at the same time echoing the property’s laid-back beachside setting. Furniture pieces from Australian makers VELA Living and MCM House are offset with luxurious fabrics – tactile velvets and exuberant retro patterns – and arresting gold finishes. Walls are hung with works by local artists and vintage images of beachside playgrounds in the 1970s. Other elements to get a refresh, courtesy of Killanoodle Design, were the mini bars (think bespoke gin blends, Italian mints and Marvis toothpaste)and in-room purchases – the green and pink tote bag is a must-have! A glamping village of luxury tents and caravans surrounded by nature in the NSW coastal town of Cabarita Beach, The Hideaway offers a stripped-back luxury with a hazy, nostalgic feel to it. Tents come with stylish furniture, some offering mini bars, air conditioning and other plush extras. Personalisation is the buzzword in travel right now, and there’s nothing more personal than picking your own room at a boutique hotel. The Collective, located in the inner-city Sydney suburb of Camperdown, doesn’t allocate rooms upon booking but allows guests to wander between them until they find something they like from among the 39 individually designed rooms that have been created by seven designers and 13 different artists; if the door is open then it’s up for grabs. Having opened its doors when Paul Keating was still prime minister (1994), Sydney’s venerable Sheraton on the Park was ready for a revitilisation ahead of its 25th anniversary, which is what it got in the form of a $40 million overhaul of its 510 guest rooms, 48 suites and Sheraton Club Lounge. Interior designer Joseph Pang has combined modern design with classic elegance to give rooms a sophisticated residential feel, using lots of wood and leather layered in a calming colour palette of celadon and warm greys. 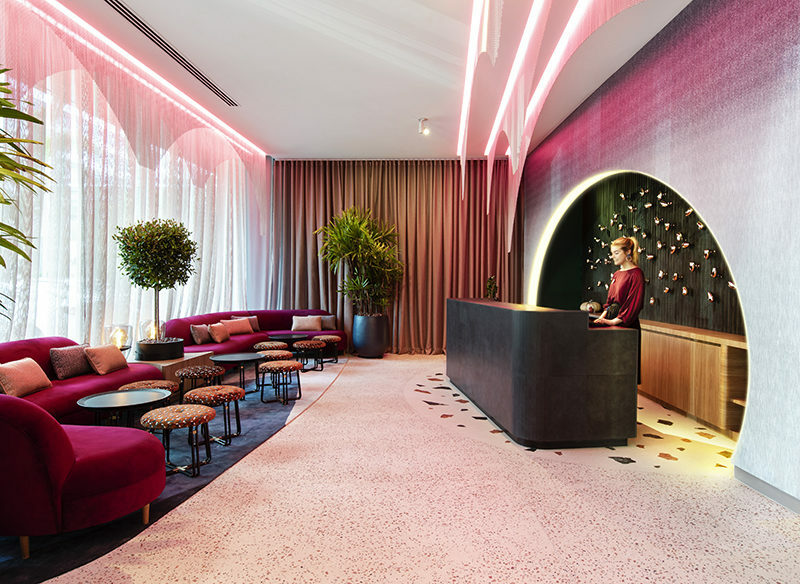 The newly refurbished Novotel Darling Square in Sydney is influenced by the nearby Chinese Garden of Friendship, and provides hop, skip and a jump access to the best dumpling restaurants in Chinatown and the buzz around the newly emerging Darling Square neighbourhood. The 230 guest rooms have been made over, with shots of restive colour and fittings in tactile wood and leather, while downstairs the new lobby bar and restaurant serves up a menu abundant in fresh produce and healthy options. A collection of 1960s grain silos on the banks of Launceston’s Tamar River have been reborn as Peppers Silo Hotel. Derelict for decades, there are now 108 guest rooms including 52 inside the original silos. The hotel has also worked closely with Guide Dogs Tasmania to employ a Canine Ambassador, Archie. The black Lab lives at the hotel and helps concierge staff greet guests and deliver the morning newspapers. Located in the ACT’s cool-climate wine region, Abode Murrumbateman’s 50 light-filled studio rooms offer city style in bucolic rural surrounds. while out and about (and there are bikes available for exploring). Situated on the stunning Bellarine Peninsula, within easy reach of the Great Ocean Road, this 15-room hotel has a sleek, modern vibe throughout, with rooms ranging from standard to penthouse, and including generous family rooms. There are plentiful cafes and restaurants nearby and the beach is a short stroll away, presenting the perfect summer bolthole.